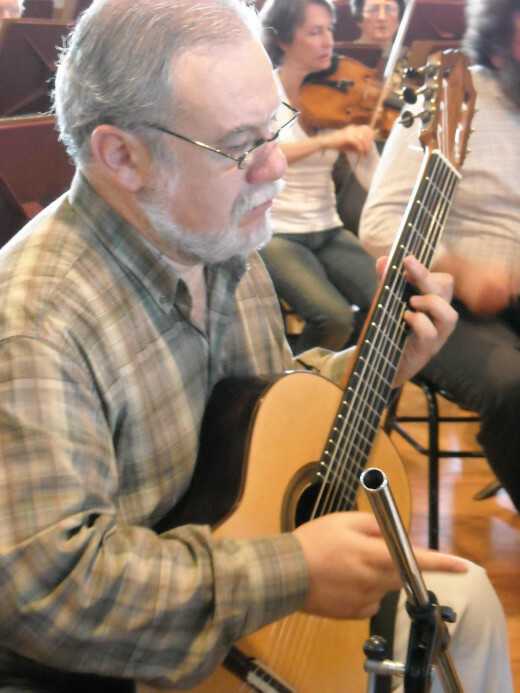 In 2008 in the Teatro 3 de Febrero, Paraná (province of Entre Rios - Argentina) celebrated its centenary with the commission of a new work by Oscar Edelstein, "La Foto del Tiempo" (The Photo of Time) for guitar (soloist Eduardo Isaac), orchestra and electronic processes. 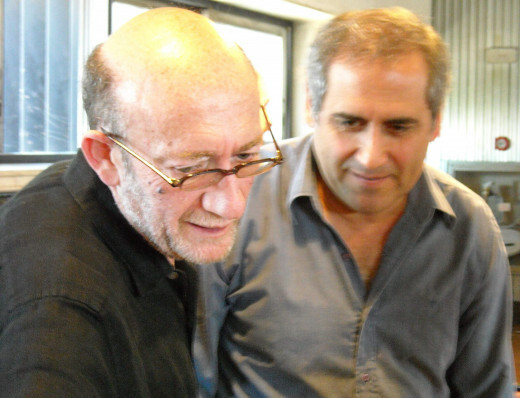 The commission represented a return for Edelstein to composition for orchestra, and first in Latin America of the use of live electronic processing of an orchestra. 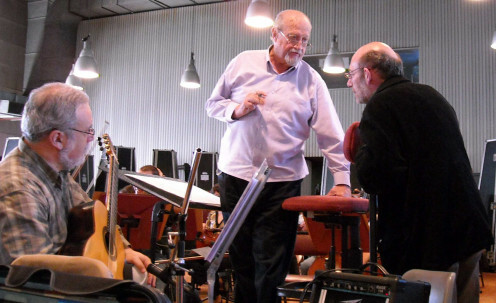 Eduardo Isaac (guitar), Pedro Ignacio Calderón (Conductor), and Oscar Edelstein (composer) in rehearsal for Edelstein's "La Foto del Tiempo." 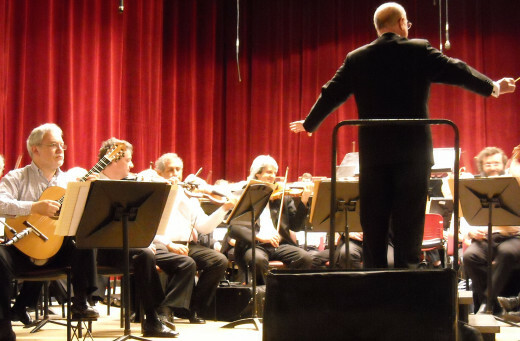 The Orquesta Sinfónica Nacional premiered the work under the direction of Pedro Ignacio Calderón and with the soloist Eduardo Isaac. 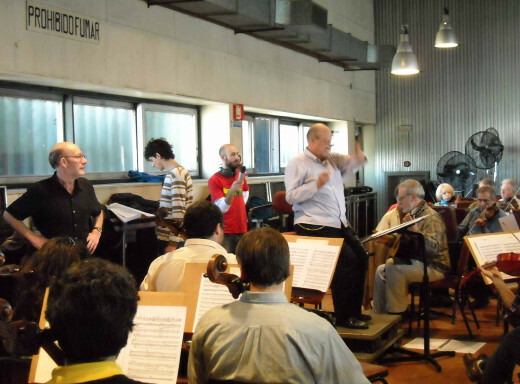 At the same time the three - Calderón, Edelstein and Isaac - were made "Ciudadano Ilustre" (Illustrious Citizen) of Paraná as a tribute from their hometown, to mark their outstanding contributions to the field of music and culture in Argentina. The work also includes a live electronic processing which Edelstein calls, "dense films and transparencies in the machine mode of the human memory." First rehearsal "La Foto del Tiempo" by Oscar Edelstein, with technical assistants, Mauro Zannoli and Damian Anache making the first sound tests. "In the first experiences of a group of Russian photographers in the early twentieth century, very long exposure times were used on film treated with dense emulsions which made them more responsive and durable. In these first cameras of the era, non-pinhole, they already counted on a reflex type of 35mm SLR, they came to use times of one, two and even three years on fixed aperture lenses. Then, from 1960 onwards, the times lasted much longer, approaching working with takes of ten and even twelve years, all now made with ultramodern cameras, acting on a particular urban site, a coastal landscape, another rural. The machine was installed there, fixed, capturing what was happening in this lapse of time, in this precise place, with this lens, and photos are then displayed without using laboratory processes. Premiere of "La Foto del Tiempo" by Oscar Edelstein with soloist, Eduardo Isaac (Guitar), and Pedro Ignacio Calderón conducting the Orquesta Sinfónica Nacional (Argentina) on 19th October 2008, Teatro 3 de Febrero (Paraná, Argentina). Isaac has obtained the first prize in international contest of worldwide relevance: " Infanta Cristina " Madrid; " Andrés Segovia ", Palma de Mallorca; " Reina Fabiola ", Belgium. 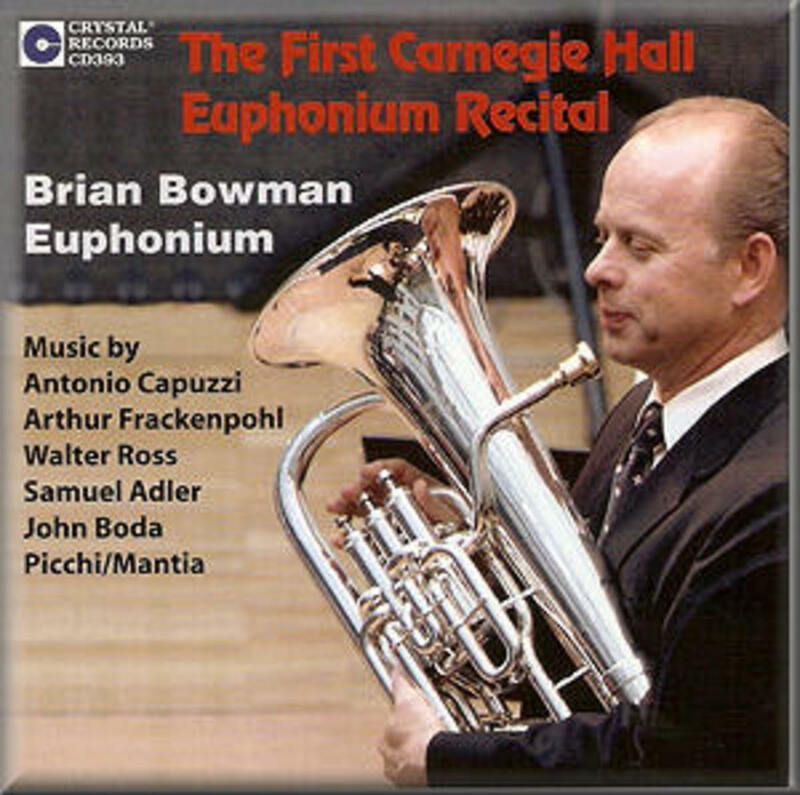 Since 1990 he has regularly recorded for GHA RECORDS (Brussels) resulting in a series of records of great transcendence dedicated to the repertoire of the twentieth century. He's been invited as a soloist by a great number of orchestras and has been directed by famous directors. 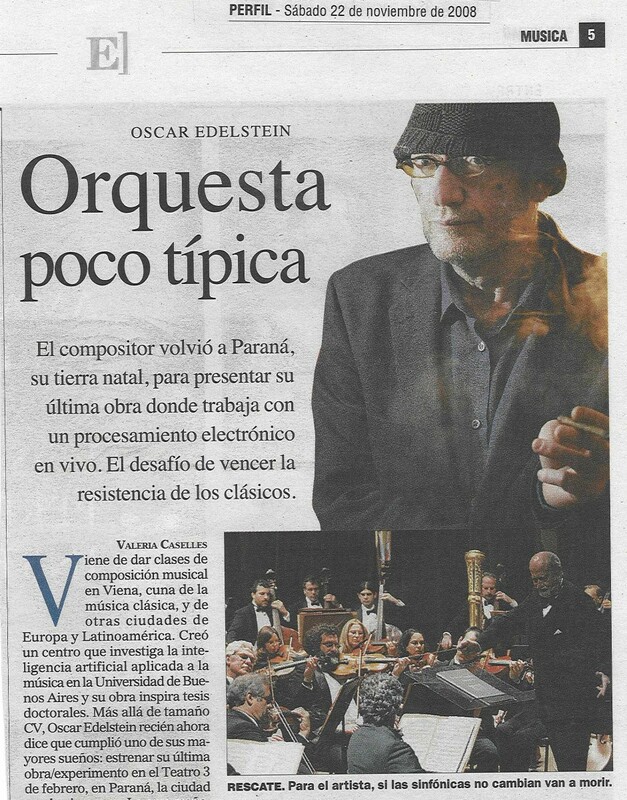 He has given concerts and has recorded for different record labels with Charles Dutoit and The Symphonic Orchestra of Montreal (Canada), George Octors and The National Symphonic Orchestra of Belgium, Leo Brouwer and The Symphonic Orchestra of Cordoba (Spain), Pedro Ignacio Calderón and the Argentinian National Symphonic Orchestra. 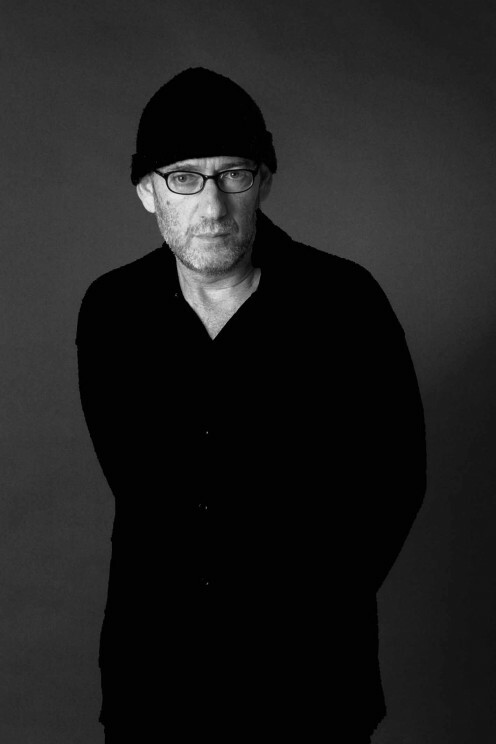 In 2009 he recorded with The Symphonic Orchestra of Salta for Sony Classical. He regularly delivers master-classes on repertoire and instrumental technique in Brazil, Mexico, United States, Portugal, Spain, Germany, Italy, Belgium and France. He has given conferences and master-classes in Japan and Taiwan. His guitar was made by the Parisian luthier Dominique Field. 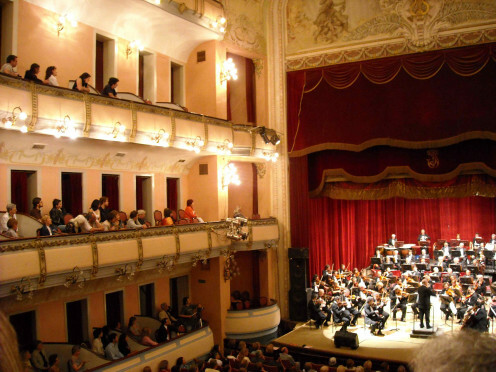 The concert was part of the centenary celebrations of Teatro Municipal 3 de Febrero, which was founded in 1908, and was made possible by the Secretaría de Cultura and the Asociación Mariano Moreno. The theatre was built in a Renaissance Italian style, but also with a reminiscence of the German Baroque and French architecture. The very first theatre on this site was founded in December 1851 on the orders of General Justo José de Urquiza. The name of the theatre, "Teatro Tres de Febrero", is in memory of the Batalla de Caseros that occurred on the 3rd of February in 1853 when Parana was the capital of the "Confederación Argentina."